Paris is served by two main airports: Charles De Gaulle – CDG (located in the north-east) and Orly (located in the south). You first need to go to Paris City Center. By ‘Le bus direct’ coach. Take line 2 (from CDG Airport) or line 1 (from Orly) and go to ‘Place de l’Étoile’ (please check the table below to find the stop). Once there, you can reach your hotel by metro or RER – the station ‘Charles de Gaulle Etoile’ is a short walk from the coach drop off spot. 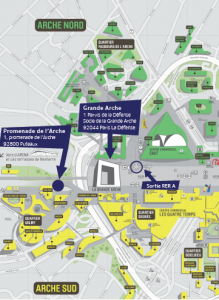 To access La Defense (where several of our partner hotels are located) from there, take RER A to ‘La Défense-Grande Arche’ (one station by RER A, direction ‘Saint-Germain-En-Laye’, ‘Poissy’ and ‘Cergy-Le Haut’) – you will need to purchase a special ticket if using the RER to La Defense; or take Metro Line 1 to ‘La Defense’ (six stations by Metro Line 1, direction La Defense). From Charles de Gaulle Airport, you can take suburban train line RER B, direction Paris. If you are heading for La Defense where several of the partner hotels are located, change at ‘Châtelet-Les Halles’ and take RER A direction ‘Saint-Germain-En-Laye’, ‘Poissy’ and ‘Cergy-Le Haut’ (for more detailed information on the journey, go to the Metro/RER website in English or in French), exit 1 at ‘La Défense-Grande Arche’ and then follow IÉSEG. The station ‘La Defense/Grande Arche’ (where the event site is located and around which several of the partner hotels are located) is a very large station that comprises a metro station, a RER station, a bus station, a regional-train station and a tram station. You will likely make use of only Metro line 1 and/or suburban train line RER A. The Metro line 1 crosses Paris from West to East and has many stops of potential interest (Charles de Gaulle Etoile, Champs Elysees, Concorde, Tuileries, Louvre, Chatelet, Bastille, Gare de Lyon, etc.). It takes about 45 minutes to go from La Defense to Gare de Lyon. RER line A is faster, but stops at fewer stations. Also, note that you need to buy a special metro ticket to reach La Defense by RER A, whereas a normal ticket works on the metro’s line 1. The centre of Paris is easily accessible from the event venue, and many sights and hotels are directly on the Metro (Line 1) and RER (Line A) lines which serve La Defense. More detailed information on the Metro/RER is available via the RATP website: click here for English or here for French. Once in Paris intra-muros, you could also use the Velib’, the city’s system of self-service bike rentals – you can take a bike from any of their numerous ‘bike stations’ across town, and return it to any of the other bike stations. The system is available 24 x 7. you can buy 1-day or 7-day tickets online or at any of the Velib’ stations. For more information and for the different bike locations, go to: http://en.velib.paris.fr/ (English version) or http://velib.paris.fr/ (French version).